Despite being a new comer to the computer component industry, Albatron have impressed quite a few people in a very short period of time. 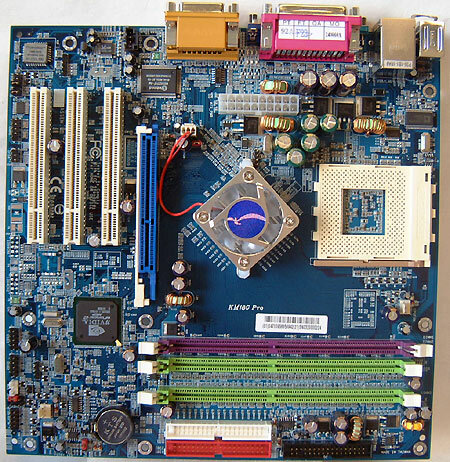 While most manufacturers are fighting it out on the nForce2 battlefield with full sized motherboards, Albatron showed some innovation and produced probably the most powerful Micro-ATX motherboard on the market called the KM18G Pro! The Albatron KM18G Pro is a bit on the pricey side with a retail price of $135 CDN ($100 US), but then again miniaturized components have always gone for more. Perfect as a home theatre or multimedia center, the KM18G Pro has 5.1 audio, 10/100 LAN and an integrated GeForce4 MX with TV-Output capabilities. For your few expansion needs the three PCI's and lone 8x AGP port should suffice. One thing we've noticed from playing with Albatron based motherboards are that they tend to be well labelled. Referring to the users manual (which is quite detailed itself) will not be necessary when you're installing this motherboard. Performance of the KM18G Pro was also very good. The layout is very good with the KM18G Pro as the floppy/IDE connectors are in the most ideal location to the right of the DIMM slots. Albatron actively cools the nForce2-IGP Northbridge, which does wonders for peace of mind. There's really not much to complain about when looking at the KM18G Pro and remembering it's intended uses. I guess some better overclocking options in the BIOS and a bit more room around the CPU socket for those larger Zalman type heatsinks would be nice too. If you're planning to build a HTPC, bookshelf multimedia system then the Albatron KM18G Pro is a much better option then any of the other motherboards in this roundup. If you're just building a regular sized PC though you can probably get by with something a bit cheaper.